A fan poster for “Django Unchained”. 1. Django Unchained- It’s Quentin Tarantino’s next movie, what else would you expect me to put as number one? It is not for that mere fact alone, however, as a lot of good directors can make bad movies (Tarantino’s own “Death Proof” was far from a masterpiece). However, what also looks promising is the film’s amazing cast, which includes Samuel L. Jackson, Christoph Waltz, and The RZA. It is Tarantino’s next attempt to relocate the Western. It started in Los Angeles, traveled to East Asia, and ended up in Nazi-Occupied France. 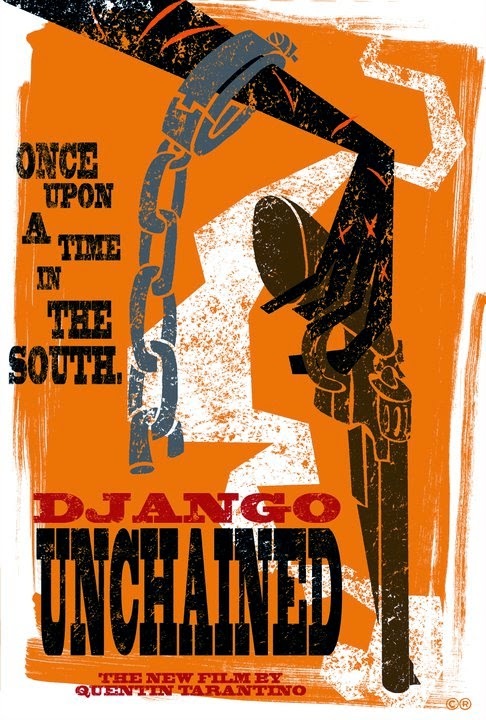 “Django Unchained” will put the Spaghetti-Western into the slavery era South. Expect scenes that go on longer than they should, but you wish could continue, and some amazing dialogue on Civil War politics and slave culture. 2. The Dark Knight Rises- When Christopher Nolan first made “Batman Begins,” he not only revived a franchise, but also an entire genre. When he made “The Dark Knight” in 2008, he had created the best comic book movie ever. Not only that, but one of the greatest action movies of our time. Can “The Dark Knight Rises” not only equal, but surpass, its predecessor. From the looks of the previews, it can. It is unfortunate that we don’t have The Joker, but Tom Hardy will put on quite a show as Bane, and be more true to the character from the original comics than “Batman & Robin” was. Nolan has just gotten better and better as a director, and “The Dark Knight Rises” looks like one hell of a way to end this amazing story. 3. The Hobbit: An Unexpected Journey- I have a soft spot for “The Lord of the Rings” movies: they helped to fuel my very hyperactive mind around the age of 10. Given the 3D and digital technology Peter Jackson is using, this chapter of Tolkien’s books will look better than ever. While this probably won’t top “Return of the King” in scope, it will stand in its own right as a superior example of how to make a blockbuster movie, and will complete the full arc of one of the greatest fantasies ever told. 4. Chronicle- I have never been a fan of the incorporation of shaky cam movies. It makes action movies more nauseating, and is a poor excuse for creating supposed “horror” (I’m looking at you, “Blair Witch Project”). But it should work for “Chronicle,” a homegrown superhero fable that made a splash on the internet with its intriguing trailer. The fact that “Chronicle is not based on a comic book gives it more creative freedom, and based on the plot I’ve seen from the trailer (kids causing chaos) with their own powers, this will probably be one of the most realistic superhero movies we’ll get. 5. Lincoln- Here’s the movie with the second best cast of 2012. It is something of a shocker that there hasn’t been a decent Lincoln movie to date, but it’s no surprise that the first one will be directed by Steven Spielberg and star Daniel Day-Lewis as Honest Abe. I am always curious to see what Mr. Day-Lewis will add to a performance, and how Spielberg will tell a story. I expect nothing but the best. 6. The Amazing Spider-Man- America might be all Spider-Maned out, thanks to the poorly received third movie and the even more poorly received play that involved the world’s most overrated musician. It might be too soon to do a “Spider-Man” reboot (“Spider-Man 3″ is only four years old), but “The Amazing Spider-Man” shows great promise. It is directed by Marc Webb (“500 Days of Summer”) and it stars Andrew Garfield (“The Social Network”) as Peter Parker. Some young energy could do good for the franchise. Plus, this will go back to the roots of the original “Spider-Man” comics, when Parker had to construct his own web blasters. In the original “Spider-Man” movies, Parker could launch webs from his arms. This change brings Spider-Man back to what he always was: a nerd, and a genius. 7. This is 40- I am still on the fence about Judd Apatow’s last movie, “Funny People” (it had brilliant moments, but it would’ve benefitted from being 45 minutes shorter). However, “This is 40″ brings back Apatow’s greatest couple, Pete (Paul Rudd) and Debby (Leslie Mann) from “Knocked Up.” Jason Segel will be reprising his role as Jason, and Melissa McCarthy (“Bridesmaids”) will join the ensemble. I’m already laughing. 8. Gravity- I know very little about “Gravity” besides the fact that it was directed by Alfonso Cuaron, and that it is a science fiction movie. The last movie Cuaron directed, “Children of Men,” was a sci-fi masterpiece and one of the greatest movies I’ve ever seen. Each time I watch it is always as exhilarating as the first. I expect some amazingly long takes of outer space. 9. Casa de mi Padre- This is one of the more peculiar projects of the coming year. It is a comedy about a Hispanic drug dealer starring Will Ferrell that is entirely in Spanish. It also stars two of Latin America’s best (and usually, most serious) actors: Gael Garcia Bernal and Diego Luna. Once Ferrell turned Luna into a running joke during his George Bush one man show, it was kismet that they would make a movie together. 10. Jeff Who Lives At Home- The Duplass brothers make some of the quietest, strangest dark comedies of the day. Just look at 2010′s “Cyrus” for proof. Jason Segel steps into the slacker role this time, as Jeff, a man who is finally forced to leave his mother’s basement in order to help his brother (Ed Helms) catch his possibly adulterous wife. Awkward laughs and awkward silences to ensue. The fact that it comes out in March will help make the early part of the year a better time for movies than it usually is. This entry was posted in 2012, Django Unchained, Judd Apatow, Lincoln, Quentin Tarantino, Steven Spielberg, The Amazing Spider-Man, The Dark Knight Rises on January 1, 2012 by ian0592.